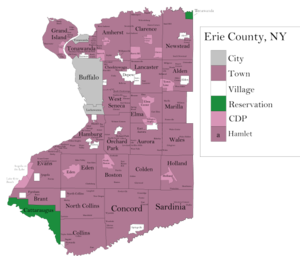 Erie County is home to the Buffalo Bills football team, the Buffalo Sabres hockey team, the Buffalo Bandits lacrosse team, and the Buffalo Bisons minor league baseball team. The city also features a zoo, a botanical garden, a science museum, a historical museum, and the famous Albright-Knox Art Gallery. The Erie County Fair, held every August in the Town of Hamburg, is one of the largest county fairs in the country. ^ a b "State & County QuickFacts". United States Census Bureau. Archived from the original on July 10, 2011. Retrieved October 11, 2013. ^ a b "Bureau of Forestry". 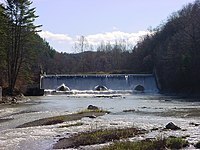 Erie County Department of Parks, Recreation and Forestry (Erie.gov). Retrieved March 7, 2015.